I gave myself the name Sylphe when I went through the usual self searching-identity-discovery-phase during my college years and emerged empty handed. You can read more about why I identify with that name here. Fast forward 10 years and lo and behold, I am mis- diagnosed with Bipolar disorder, then eventually a year later; Borderline Personality Disorder. Rewind 2 years; memories of childhood abuse begin to surface. That year I pursued graduate studies in Pubic Health (MPH) at the University of the West Indies. During a session of Sexual Abuse Awareness, I realized I had more in common with the orator (survivor) than I felt comfortable with. Rewind 4 years to this session, I become a member of a legalistic religious organization, during which I became familiar with the term ‘Spiritual Abuse’. 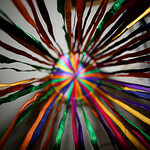 You can read about my connection between sexual and spiritual abuse here.I saw these wildly colored ribbons as loose ends dangled from my amorphous-like life and it began to dawn on me…. The abuse, the experiences, my poor choices… my sense of a lack of identity. So, I blog my process of figuring it all out, surviving it all and my journey to complete healing and freedom. I blog to increase awareness and to offer support to others who have similar stories.. I blog because I am a Jamaican which means I live in a country where these topics are not openly shared for fear of judgement, discrimination, stigma …or plain old fear that usually accompanies ignorance. You may want to start with my journey out of a Spiritually abusive church here and here. The connection between my childhood abuse and mental challenges here.